I've just completed assembling a hybrid 1964 Buick Special and an '87 Grand National powertrain. I got the car started last evening, however the idle is not tuned. 1. In step 1 it says to "ground the ALDL diagnostic lead (short the top two rightmost pins in the ALDL connector)". Does this mean to short them together, or to short each individually to ground? 2. In step 7 it says to adjust the throttle stop screw to set the idle. Is this screw obvious on the throttle body? Is this it? 1. The procedure is to jump the pins on the ALDL connector. 2. 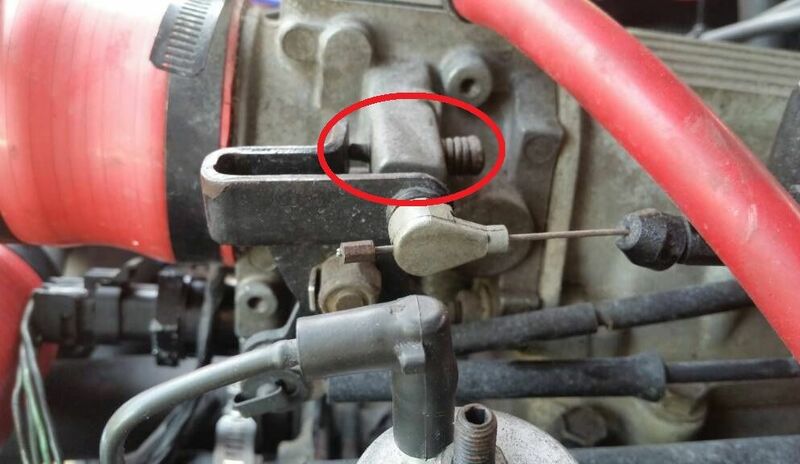 Yes, the photo shows the throttle stop screw. I'm currently not generating any codes from the ECM. However, I'm not sure I am achieving the desired idle within an acceptable adjustment range of the throttle screw. I essentially had to remove the screw from the throttle body and shorten the tension spring. This was the only way I was able to provide enough travel of the screw to achieve the throttle position for a consistent idle. Is this normal, at at least not abnormal? I'd like to verify this before beginning the TPS adjustment. Any feedback is appreciated, as I'd like to get this running well this weekend so I can have the exhaust done on Monday. I'm from MI, so I'm trying to get this thing ready for Woodward! The throttle stop does not set the idle rpm...the chip does using the IAC motor. The procedure sets the base throttle idle position not the idle rpm. If I'm not mistaken you are supposed to short the top two pins together (A to B), turn the key on, wait about 30 seconds so the IAC sets itself then disconnect the plug on the IAC. Then you are supposed to remove the jumper then start the car. Then you adjust the throttle stop to about 500 rpm. Turn the car off and reconnect the IAC connector. Then turn the key back on and set the TPS to .42-.44 volts. Repeat the procedure If the idle rpm is not around 500 rpm when putting the computer back in diagnostic mode. If you have a scan tool you can just look at your IAC counts and adjust the throttle stop until the IAC counts are in the 20-30 range and check your TPS setting to make sure it is in the .42-.44 volt range. If not you will have to readjust the TPS. You will most likely have to go back and forth between the throttle stop adjustment and the TPS adjustment until you get it right. Also, Fwiw....i just set mine,and can almost assure you that at the setting,in your pic, that the throttle blade is way too far open. Most of the ones i have set have just a couple threads of the adjuster screw showing and just barely crack open the blade. My readings where 90's intill i pulled the IAC and cleaned it and the passage ways in the throttle body. Yes the ECU controls idle . What chip in ECU? Yep, followed that procedure to a T. I am unable to get it to idle at 500rpm unless the throttle blade is that far open. I followed that with the TPS procedure and was able to get the voltage range for both idle and WOT. However, drive ability is crappy right now- it’s hard to keep running at any rpm. Also FYI, that photo isn’t my car, but it is representative of my current adjustment. Curious if the IAC needs cleaning as suggested by turbocamino. With no codes being displayed, I’m not sure where to start. I was trying to avoid the $250 for the scan tool and found the procedures for IAC and TPS on gnttype.org. If I gotta get the tool I will, but understood the info on that site was quite reputable. Your going to need some type of scan tool if you are ever going to get it running right. A stock chip has a target Idle of 750 rpm. As suggested the stock chip (ACXA or BBKJ) should be replaced with a more modern chip like one from Turbotweak. You have to make sure the ignition system is in good shape and you have the proper fuel pressure to start with. Where did you get this motor setup from? How many miles on it? You have to make sure the MAF sensor is working properly or it will never run right. Sounds like I have some more work to do here.. I have a lot of experience with older cars and restorations, but this is my first attempt at EFI. Ok, the engine has ~ 100,000 miles. The engine was removed from an '87 GN that "rusted out around the engine". The seller said that the car run well before disassembly, but you never know for sure. The engine as received had consistent pressure in all cylinders, and it showed some evidence of grime around the #2 cylinder by the turbo. I tore down to the short block and saw a small leak in the passenger head gasket (which explained the grime). I inspected the bores and found them to be in unbelievably good condition. The heads were checked for valve and spring condition and looked good. The turbo was dry (not pushing any oil) and spun freely. I did not rebuild or disassemble the short block. So basically, I'm starting fresh. Getting the idle and throttle position were the logical first places to start for me, but like I said, I don't have any experience with EFI or this engine, so I really don't know for sure where to start. I'm in MI, and relatively closer to Full Throttle Speed, so I can get my hands on a Scanmaster in short order. Will you have crossed ever t and dotted every i.The throttle blade would not need that much opening even if the IAC was plugged or not working at all.check engine light is so strange on these cars it seams like the only time I can get my light on is leave something unplugged.When you get the scanmaster tool it will give you numbers to start with. Engine assembly was done by me. The TPS was not removed from the throttle body during disassembly, so I used it's current position as a starting point. Although, I did attempt to adjust it using the GNTTYPE procedure, using a meter. I'm currently just outside of the windows of voltages at idle and WOT, per that procedure (0.47V @ idle 4.50V @ WOT). The MAF only has a screen on the inlet flow side. The cam sensor was installed using the Casper's tool and procedure (25 deg ATDC). This method and tool seemed kinda fool-proof, and it was my understanding that if this we installed incorrectly, the car would barely run, or wouldn't run at all. http://www.vortexbuicks-etc.com/index.html There are some great sections on what the Scanmaster tells you and troubleshooting. You need to do the TPS/IAC dance. That is a fun exercise in frustration but if they aren't adjusted right you'll be chasing your tail. I don’t want to admit but it took me three times to get it right one time(cam sensor) and I was successful half a dozen times before.Casper tool a must have and fuel pressure, I have never verified ignition timing,but there is sticky note about it somewhere here. Let me describe in more detail what type of running issues I'm having. Maybe a little more info will trigger something with you guys. After getting the engine management system hooked up and rechecking all the leads/connections, the car immediately fired up, which was initially exciting. It didn't want to continue to idle, but the idle seemed reasonably smooth. It settled down from fast idle quickly, and wouldn't continue to idle. That's when I located the GNTTYPE procedures for IAC and TPS adjustment and did them. The idle got better, so I put the car in gear and attempted a trip around the block. Once I put it in gear, it didn't want to continue to run - I had to feather the throttle to keep in running. While trying to drive it around the block, it found a "spot" where it ran smooth at ~1000rpm, but deviations from that engine speed required more throttle feathering to keep it running. When I returned to put it in the garage, I had to continually feather the throttle to keep it running as I was putting it back on the lift. I'm almost certain I have the cam sensor correctly installed. If you are sure you started at TDC of the compression stroke (I am, because I felt cylinder pressure in #1 spark plug hole as I was rotating to TDC), follow the Casper's procedure with the Casper's tool, install the cam tool body at 25 deg ATC with the window pointing towards the passenger side of the car (between 3-4 o'clock), and perform the rotation sequence until the LED illuminates, how can it be wrong? I'm assuming that's what is meant by checking injector firing order. If this is slightly out, will it cause the driveability problems described? I'll be (hopefully) picking up scan tool from Full Throttle tomorrow, so I should have some sensor values to look at/report back soon. I'm nervous about the MAF, as I'm using a remanufactured AC Delco stocker, and understand they're not very reliable. I'm interested to see the MAF values on the scanner. If I need a MAF and translator, I may have to wait - that's $350 that's not in the budget currently. Need to verify "stock injectors", did you have them cleaned and flowed before installation? By the way I have been following your build and wishing you the best! Yeah, it's gonna be a "rocket ship"! I did not have this done. I added new o-rings and the plastic rings and caps, but no internal cleaning or flow work was done.